Touch Cast - All about apps in YOUR classroom! TouchCast creates an interactive presentation that mixes video with web content. The app lets you record a video and overlay elements such as web pages, maps, photos, Twitter streams, polls, quizzes and more. Users watching the video can click on these multimedia elements and interact with them while the video continues to play. You start by recording a video using your iPad's camera. You can pick from several themes like newscast or review that'll insert titles and other elements to get you started. TouchCast uses a timeline to lay out the elements of your video and allows you to drag / drop extra content like titles, a whiteboard and vApps. vApps are the multimedia features such as maps, Facebook content, Twitter streams, Flickr photos and more. There are a lot of options within the editing side and it does take some trial and error to get elements to appear where you want them to be. When you are done creating your TouchCast video, it is hosted online on your TouchCast channel. From within the app, you can share these TouchCast videos via Facebook, Twitter and email. You can also upload it to YouTube as a regular, non-interactive video. 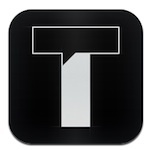 The app also lets you preview TouchCast videos created by both the company and other TouchCast users. These galleries give you a feel of what type of videos the platform can be used to create. This app combines video and web in amazing interactive ways. This app is simple to use and can be used across all subject matters.